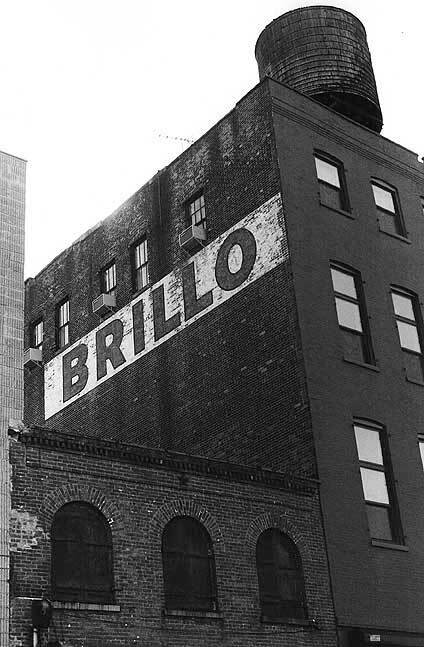 The Brillo Manufacturing Co. plant was located at 60 John St. in Brooklyn, NY from 1942 to 1974. They also had an office in Manhattan at 517-523 West 45th St.
Brillo steel wool soap pads have been in use since 1913, and are currently being made by Church & Dwight Co., Inc., better known for their Arm & Hammer baking soda. The original Brillo was taken over by the Purex Corporation in the late 1960's. Brillo's trademark registration filed in 1920 cites 1913 as the date of first use in commerce, and describes the product as "Soaps, Cleaning, Scouring and Polishing Wads, Pads, Rolls, and Cloths, of Abradant Nature, and Abrasive and Polishing Material for Removing Foreign Matter from Metal and Other Surfaces."